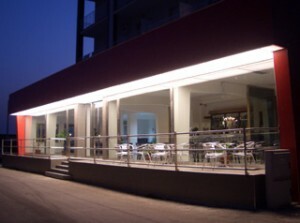 The hotel is situated directly on a wide sandy beach on the Gulf of Salerno . All rooms are equipped with a large balcony from which you can see the sea on one side with the magnificent Amalfi Coast and on the other the Agropoli promontory. We decided to give priority to space and comfort and provide a service to meet our customers’ high expectations. Sea, sun, the beach and the garden give everybody somewhere that best suits your needs. A panoramic hotel situated on a wide tranquil beach. 3 bars, restaurant and pizzeria are at your disposal and can offer you the relaxation you were looking for, enjoying the local “Campana” or even national dishes. Nearby, you’ll find the vestigia of Paestum and Pompei, the enchanting panorama of the Costiera Amalfitana, with Positano, Ravello and the aristocratic Capri. And… there’s Napoli….! !